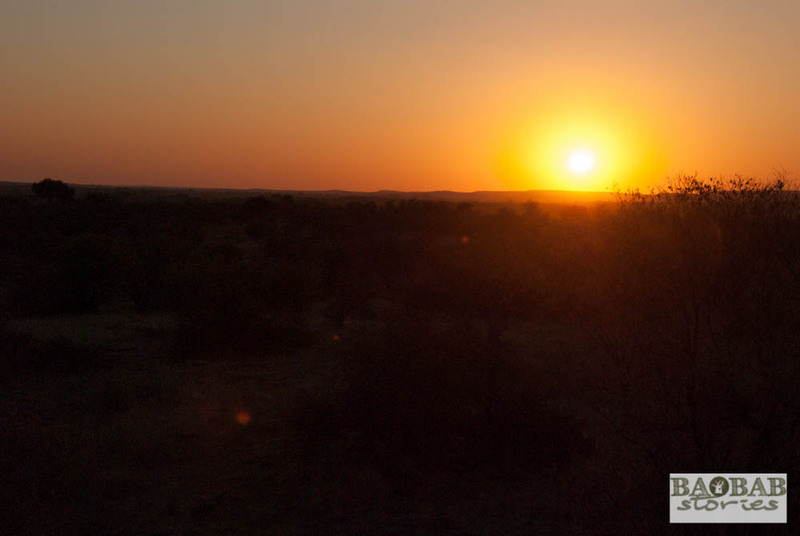 The red glowing sun has started its descent and approaches the far horizon quickly. 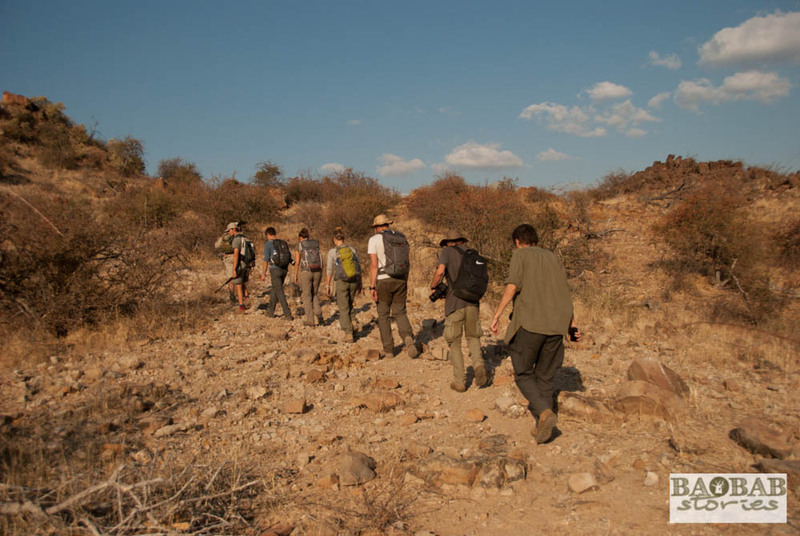 We are climbing the stairs to experience an incredible treat: a sundowner on Mmamagwa – a very special place in Mashatu in the Tuli Block (South-East) of Botswana – where we will end the final excursion of our Trails Guide course with EcoTraining. 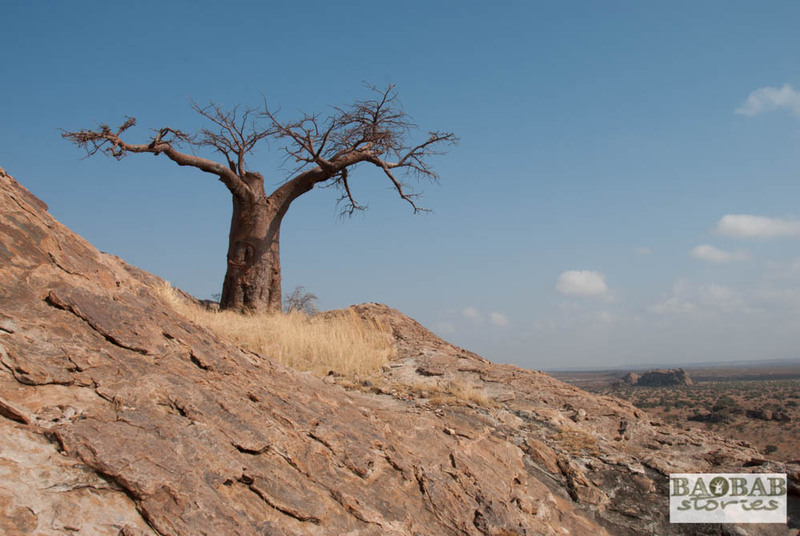 We gather around the one and only tree on that extraordinary hilltop called Rhodes Baobab. 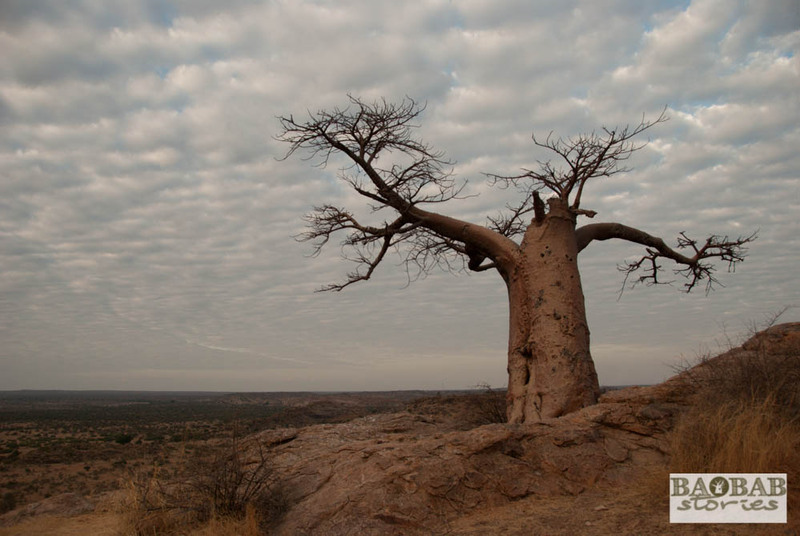 The view is incredible – we delve into the vast landscape and listen to instructor Henry Parsons’ baobab story*. As someone who has worked for the better part of his life in the bush, Henry must know a great deal about the giants. Naturally I CRAVE to find out as much as possible of his Henry experiences on the Mashatu baobabs and the trees in general. 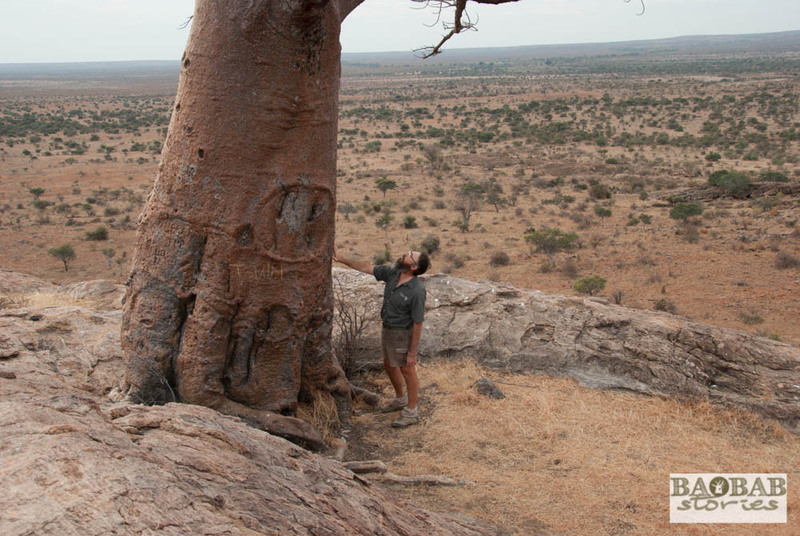 He reveals that the baobab is „one of the trees that I love and it is very much part of the landscape in Mashatu“. Over the last few weeks we got a good chance to explore the area where we happened to come across some of those marvellous trees. 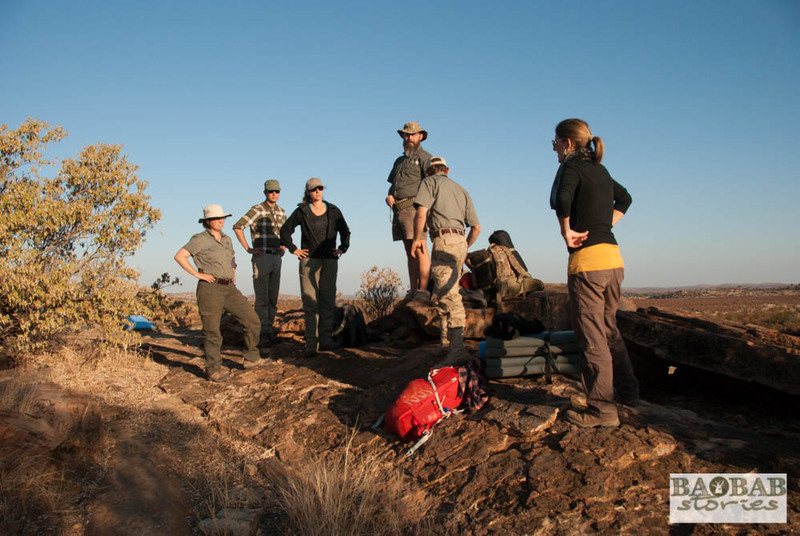 „This land is called the land of the giants where elephants play a big role as do the baobabs“, our instructor explains. 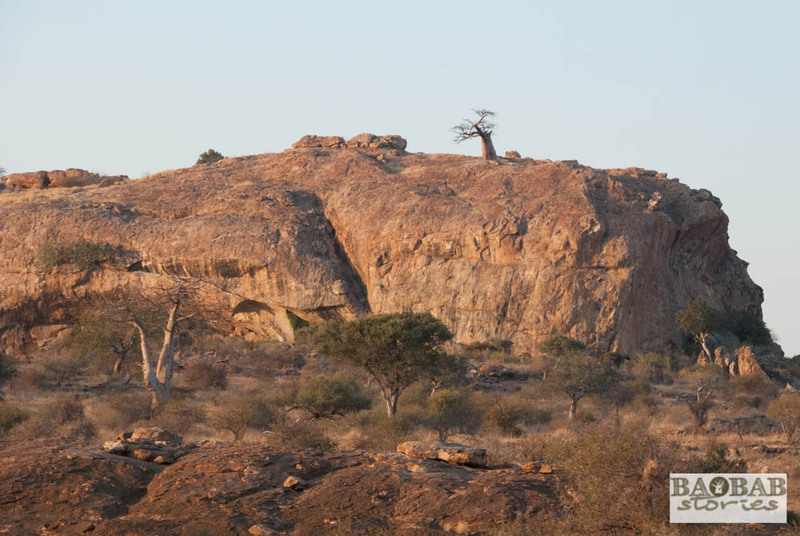 To complete the picture he adds the impressive Mashatu trees and that beautiful Mashatu landscape itself. „Those are the four giants that make this place as magnificent as it is“, he says. His list is not finished yet. „There is a fifth giant that a lot of people gloss over or do not necessarily know about – which to me is the spiritual side, the magic that brings people to this place“ and he continues „There is this feeling you cannot put your finger to it and you cannot explain it – that is the fifth giant to me.“ As a matter of fact he is very right – Mashatu exudes tranquillity, seems timeless and a place where the troubled soul can find peace. The never ending spin of thoughts stops and one can just „be“. Henry refers to the different uses of baobabs – for example local communities weaving baskets and mats and bracelets. 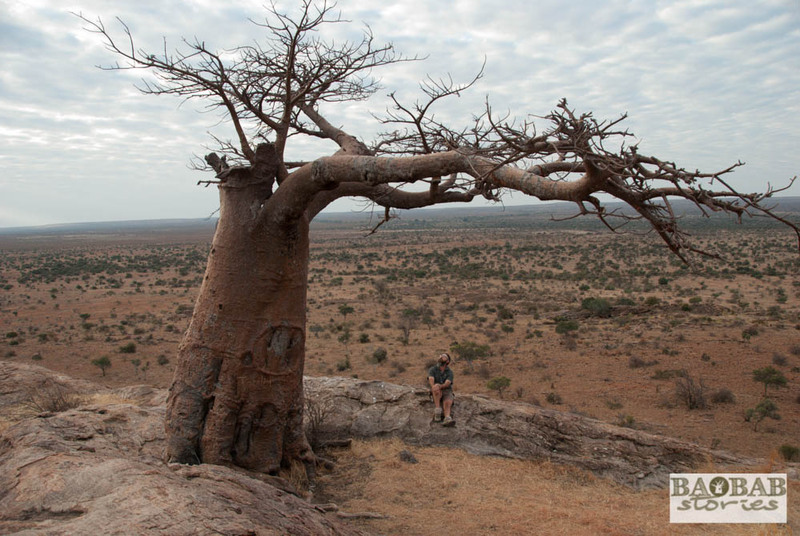 In the previous year he found a baobab that was heavily stripped by elephants. He took some of the fibres that were sticking out from under the bark and made a bracelet from it „that I still wear“, he shows us proudly. Of even greater importance to him is the fact that baobabs host and sustain life of many creatures – for example Mottled Spine Tails, Boom Spine Tails, Musk Swallows and Buffalo Weavers using the trees for nesting. Leopards like to store their kills in the trees or love to rest on the huge branches. Elephants love them as well – they tear out huge chunks from the trunks or branches and chew on them to get to the stored water and nutrients. We move on to his favourite traditional baobab story which reveals an explanation why the trees are called upside-down-trees. „One day hyena got the ‚short end of the stick‘ because it was the last in row when the animals were created. Unfortunately, only spare parts were left – they were put together and as a consequence the animal looked somewhat out of proportion: it got short back legs, long front legs, a funky tail and all in all it is not one of the prettiest creatures on the planet. Which, of course, upset Hyena because it looks so different and somewhat unbalanced. The creator called all animals together and gave them seeds to help him plant the kingdom of plants. Because it was still sulking hyena arrived last and therefore had to take what was left: the seed of the baobab. The silly creature decided to get its revenge and planted the seed upside down. „This is one of the myths why it looks like an upside down tree with its roots on top stretching to the sky“, Henry says. 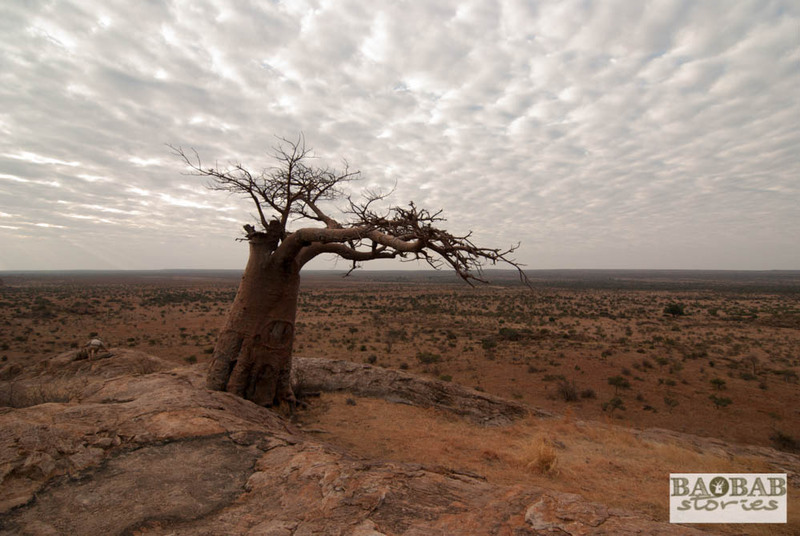 This entry was posted in Baobab_Location, BaobabFriends, Myths, Stories, Travel and tagged Baobab, Botswana, EcoTraining, Henry Parsons, Mashatu, Myth, Tuli Block by Heike Pander. Bookmark the permalink.